This was a lazy day. Tanja was to be picked up at ten for her silver workshop, so we had breakfast at our resort. It was “expensive”, at about 100 THB per person. We also arranged for check-out and the transfer to Koh Tao, which cost 350 THB per person, including 100 THB per person for the taxi service to town. The transport from the main road down to the actual beach and resort is in pretty bad shape (as are most gravel roads here), and at one point, after a slightly sharper corner, where she felt the need to stop, there’s a steep section. Anybody who has tried to learn skiing recognizes the feeling, when the slope below you seems impossible to manage in a controlled way; you’re sure that there’s no way to start moving without losing control of your speed, and then you will have to crash to stop before something even worse happens. That’s just about what happened to Madeleine at this point. I realized that she was about to panic and freeze up on me, so I did my best drill sergeant impression and told her there was no way she was going to leave the bike and walk, ’cause this slope isn’t half bad. I told her to look far ahead and brake using her rear brake only, which, after a little while of reluctance she did, and as I said, nothing bad happened. But that was later. The first thing we did when we got our bikes, was to try to reach a waterfall that’s marked on the maps near Mae Haad. The only problem, is that the place is bone dry. Last time we were here, we figured we were simply here too late in the season, but this time I made the connection with the water pipes going along the road; perhaps they’re taking water from this place and using it elsewhere on the island? But since there wasn’t any water in the ‘fall, we decided to go get lunch instead, so we continued along the main road, to Chalok Lam, where we parked by the 7-eleven by the crossroads and had some noodle soup from the kitchen on the west side of the road. As always, the ingredients were very fresh, and the food was very good – and not too expensive, at 50 THB per person. After lunch, we decided to go back to Haad Gruad, to cool down in the pool for a while. I spent most of the rest of the afternoon in the hammock with my book, until about half past three, when we went to Thong Sala to pick up Tanja from her workshop. She was glad and proud as can be, after making a beautiful silver ring in just a few hours. Seems like we’ll be buying some tools for shaping and soldering silver in a not too distant future. After picking her up, we had some curry with rice at the foodstalls, again only setting us back 30 THB. 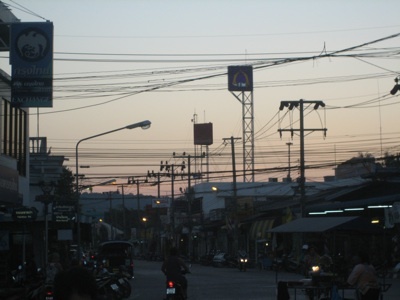 In the evening, on request from the girls, we went back to Haad Rin to catch some people. The beach wasn’t extremely lively. Tanja and I went up to The Rock to have a beer and just chill, while the slightly more dynamic duo tried to get people to dance down at the beach. A while after midnight, we decided to head back, and just detour around the place for the Half Moon Festival. This was the latest we rode back, and this time it actually got really chilly on the way back.